In Greek mythology the hero Theseus in his journeys meets a stranger Procrustes who offers him hospitality, including the use of his wonderful bed which ‘fits every guest and cures him of every ill.’ While Procrustes is preparing the bed for Theseus, Procrustes’s servant girl warns Theseus about this bed and why Procrustes is called the Stretcher. Our educational system has become a Procrustean Bed, not measured in inches but in proficiency. The state and federal governments along with the school districts have provided a measure to which some students are stretched and others are not allowed to exceed. Every child is different. Each child has different strengths and weaknesses. Each child learns at a slightly different pace which varies across subjects. For a large number of students, perhaps half, the standard classroom pace is appropriate. For about one-quarter the pace is too quick. For another quarter, the pace is too slow. Within these quartiles there is great variation and for some the pace will be impossibly quick and for others frustratingly slow. No Child Left Behind and most standardized tests like Michigan’s MEAP do not take these natural learning velocities into account. A child is judged academically by how he fits the bed of the common core curriculum measured in standardized tests. Children who fall short are stretched, sometimes severely, to attempt to fit them to the Procrustean Bed. Children who exceed the standards do not have their legs hewn off. Instead, they are often hobbled, prevented from using their academic legs fully. This isn’t fair or beneficial to either group. If the common core curriculum is based on what an average student should be able to learn in a standard school year, by definition it will surpass what some students are able to learn. This is not Lake Wobegon. Not all our children are above average. Being below average in an area is not something to be ashamed of, despite our society’s abasement of those below average in intelligence, athleticism, height, and other innate traits. However, it is also not something to be ignored in determining the best course of academia for a learner. Insisting a student only capable of learning at a slower pace stretch to move at the average pace will leave that student frustrated and robbed of the joy of learning as the child’s hard work is rewarded with C’s and D’s. How long will a child expend significant effort for low grades? Conversely, the common core curriculum will be too easy for some students. Even though our society often esteems those whose traits are above average in an area, there is no reason for pride in these accidents of birth and genetics. Again, it should not be ignored. Insisting a student learn at a slower pace robs the child of the joy of learning as the material is repetitious. Rewarding the student’s insignificant effort with A’s teaches the student that innate ability is more valuable than a strong work ethic, a debilitating lie that affects the child his entire life. We need to refashion this Procrustean Bed that stretches some children beyond breaking and hobbles others. We need to recognize that the height of each child’s ability varies and that the educational platform must be tailored to each student to help them grow. To base the length of the academic bed on chronological age denies the unique strengths and weaknesses of each child – and also denies that there are children as academically gifted as a professional athlete is athletically gifted. Differentiated curriculum in the standard classroom, the latest method used in many schools, should be lengthening or shortening the bed to the appropriate size. Unfortunately, due to lack of desire, time, and training, differentiated education often amounts to changing the (work)sheets and claiming that the bed now fits. Some school districts have begun unshackling students from chronologically-based Procrustean Beds and freed them to grow. A number of school districts in Alaska, Maine, Colorado, and Missouri have begun classes based on skill and mastery instead of age. Once a student has mastered a skill, he is able to move on. This allows a learner to work at a pace and level academically aligned to his abilities. A student skilled in an area can advance quickly and take college courses when appropriate. A student whose natural pace is slower can remain with a skill until it is mastered. This tailored approach has benefited learners. According to the Marzano Research Laboratory, students taught using this technique are 2.5 times more likely to show proficiency than students using a traditional approach. It also cuts down on discipline problems often caused by bored advanced learners and frustrated struggling students. However, even backers of this approach recognize it is a tricky and radical approach that requires significant training and the learning community of teachers, students, administrators, and parents must support it in order to effectively implement it. By converting one elementary school in a larger district to this approach and filling it through in-district choice, a district could test out this unique approach to education and free learners from this Procrustean Bed. What a clear way to look at the problem of education; I love the analogy. 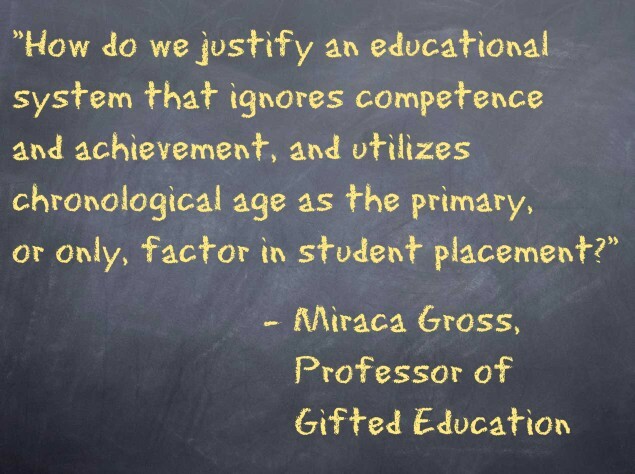 I think it bears repeating that there is no “better” or “worse” with regard to where a student is or what their capabilities are; so many people are emotionally invested in the labels they apply. We need to simply meet students where they are and go from there, at the pace that suits them, without judgment or emotion. There is no “bad” or “good” with regard to what a student can or can’t do. Progress is all, not labels. Nice post; thanks for this! Thank you for this profound and meaningful post! Sisyphus would take encouragement from reading. For a lighthearted yet serious video essay on “How Schools are Killing Creativity” view Ken Robinson at http://www.ted.com.